A page on that powerhouse of energy, and award winning artist, Debra Sloan, has been added to the studioceramicscanada.com website. Debra’s babies, dogs and horses are familiar to many. 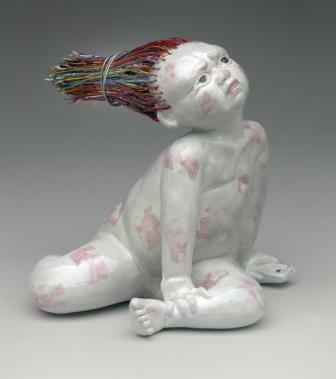 Her press moulded and slip cast figures sometimes entertain but mostly challenge the viewer’s assumptions and attitudes through their poses, gestures, surfaces and expressions. 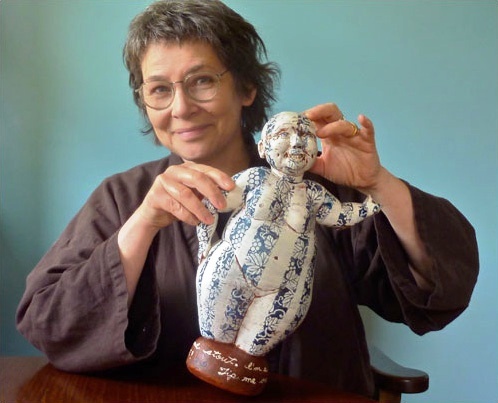 In addition to her art she has exhibited and traveled internationally and has also researched and documented the history of the development of studio ceramics in British Columbia. Enjoy this page and let Debra know how much you appreciate her art. You can also see more about her on her own website http://www.debrasloan.com/ . Breaking news: Last week Debra was awarded the biannual Hilde Gerson Award by the Craft Council of BC. Congratulations, Debra! This entry was posted in British Columbia, Casting, Contemporaries, Contemporary and tagged Babies, BC, British Columbia, Debra Sloan, horses on July 30, 2015 by Barry Morrison.